Mike Greene - mgreene@shawmedia.com Prairie Ridge's Sarah Kilhoffer jumps in the air to hit a ball on offense against Freeport during the Class 2A Sectional Championship Friday, May 25, 2012 in Belvidere. 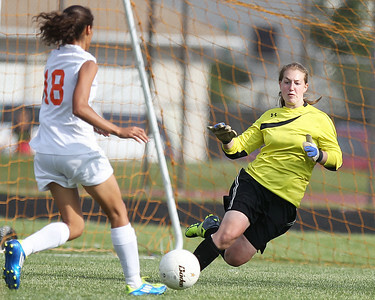 Freeport won the game 2-1. Mike Greene - mgreene@shawmedia.com Prairie Ridge's Bri Fenton and Freeport's Allyson Hayner vie for a bouncing ball during the Class 2A Sectional Championship Friday, May 25, 2012 in Belvidere. 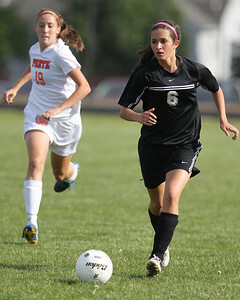 Fenton scored Prairie Ridge's only goal. Freeport won the game 2-1. 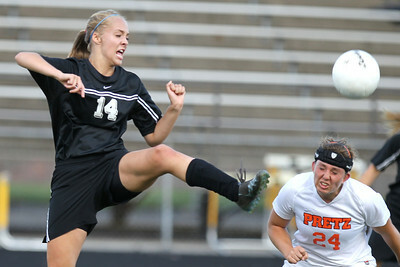 Mike Greene - mgreene@shawmedia.com Freeport's Darice Brooks takes a shot on goal against Prairie Ridge's Brooke Laibly during the Class 2A Sectional Championship Friday, May 25, 2012 in Belvidere. 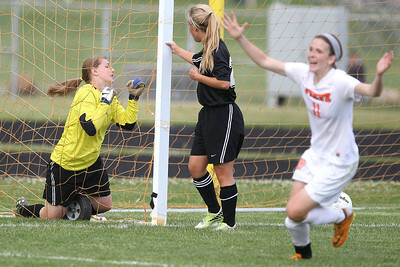 Laibly blocked the shot, but Freeport would go on to win the game 2-1. Mike Greene - mgreene@shawmedia.com Prairie Ridge's Becca Hoklas untucks her jersey after the Class 2A Sectional Championship against Freeport Friday, May 25, 2012 in Belvidere. Freeport won the game 2-1. Mike Greene - mgreene@shawmedia.com Prairie Ridge's Chandler Evans headers a ball during the Class 2A Sectional Championship against Freeport Friday, May 25, 2012 in Belvidere. 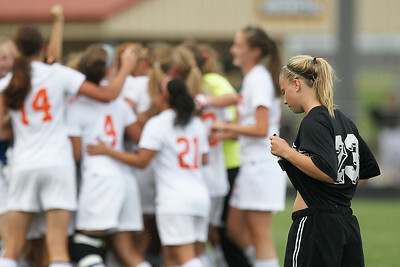 Freeport won the game 2-1. 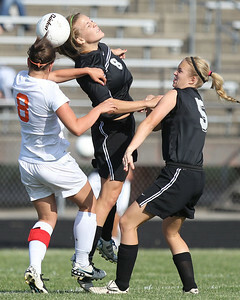 Mike Greene - mgreene@shawmedia.com Freeport's Julia Luecke and Prairie Ridge's Bri Fenton fight for posession during the Class 2A Sectional Championship Friday, May 25, 2012 in Belvidere. 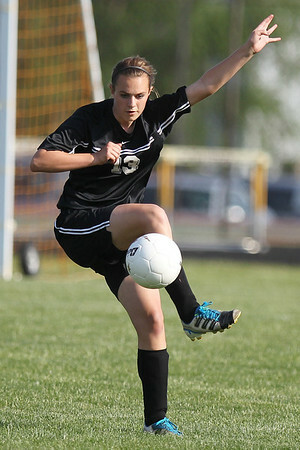 Fenton scored Prairie Ridge's only goal. Freeport won the game 2-1. Mike Greene - mgreene@shawmedia.com Prairie Ridge's Chandler Evans clears the ball out of the defensive zone during the Class 2A Sectional Championship against Freeport Friday, May 25, 2012 in Belvidere. Freeport won the game 2-1. 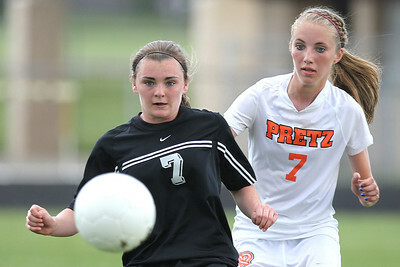 Mike Greene - mgreene@shawmedia.com Prairie Ridge's Allyson Walsh dribbles the ball down field as Freeport's Mariah Katzenberger pursues during the Class 2A Sectional Championship Friday, May 25, 2012 in Belvidere. Freeport won the game 2-1. Mike Greene - mgreene@shawmedia.com Prairie Ridge's Jordan Reitz (center) headers the ball while surrounded by teammate Cassie Warton and Freeport's Megan Schierer during the Class 2A Sectional Championship Friday, May 25, 2012 in Belvidere. Freeport won the game 2-1. 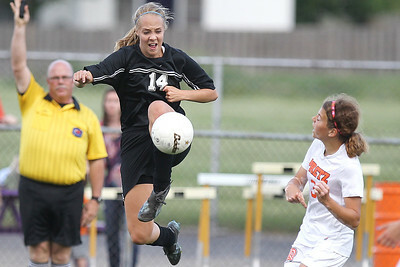 Mike Greene - mgreene@shawmedia.com Prairie Ridge's Sarah Kilhoffer kicks a ball in the air as Freeport's Morgan Geiser attempts to header the ball during the Class 2A Sectional Championship Friday, May 25, 2012 in Belvidere. Freeport won the game 2-1. Mike Greene - mgreene@shawmedia.com A Prairie Ridge player clears the ball out of the defensive zone during the Class 2A Sectional Championship against Freeport Friday, May 25, 2012 in Belvidere. Freeport won the game 2-1. 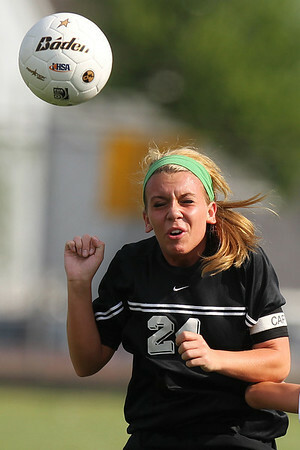 Mike Greene - mgreene@shawmedia.com Prairie Ridge's Cassie Warton dribbles the ball down field while being pursued by Freeport's Kirsten Pontius during the Class 2A Sectional Championship Friday, May 25, 2012 in Belvidere. Freeport won the game 2-1. Mike Greene - mgreene@shawmedia.com Prairie Ridge's Allyson Walsh kicks the ball out of the air while colliding with Freeport's Erica Hasken during the Class 2A Sectional Championship Friday, May 25, 2012 in Belvidere. Freeport won the game 2-1. Mike Greene - mgreene@shawmedia.com Prairie Ridge's Jordan Reitz takes a free kick near the opponent's goal during the Class 2A Sectional Championship against Freeport Friday, May 25, 2012 in Belvidere. Freeport won the game 2-1. Mike Greene - mgreene@shawmedia.com Prairie Ridge's Brooke Laibly holds onto the net while teammate Ali Fanning looks on after Freeport scored to take the lead late in the second half during the Class 2A Sectional Championship Friday, May 25, 2012 in Belvidere. Freeport won the game 2-1. Mike Greene - mgreene@shawmedia.com Freeport's Darice Brooks (left), Erica Hasken and Haley Swords celebrate after Brooks scored a go-ahead goal during the Class 2A Sectional Championship against Prairie Ridge Friday, May 25, 2012 in Belvidere. Freeport won the game 2-1 with Brooks goal being the clincher. Prairie Ridge's Sarah Kilhoffer jumps in the air to hit a ball on offense against Freeport during the Class 2A Sectional Championship Friday, May 25, 2012 in Belvidere. Freeport won the game 2-1.